I wrote about Bailey last December. 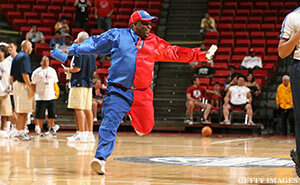 I knew he had made a bit of money off his Clipper Darrell persona -- mostly through appearances -- but as far as I could tell, he likely had spent a far larger sum on being a fan, from his red-and-blue custom suits to his tricked-out Clippermobile. Beyond that, I find it hard to believe that Bailey was taking money out of team owner Donald Sterling's pockets via small side gigs -- the official team mascot, maybe -- and even if he was costing the club a small amount of potential revenue, he likely made up for it via publicity and public goodwill. The Clippers contend that Bailey overreacted to the club informing him that if he was going to continue with his one-man campaign of trademark infringement, he would have to follow the same rules as actual team employees. Bailey says otherwise. I think there's probably some truth to each version of events: the Clippers long have managed their affairs in clumsy, tone-deaf fashion, while Bailey is unusually wrapped up in his fandom alter ago. Miscommunication seems inevitable. That said, I also think there's something bigger at play here, something that gets to the cold, transactional heart of what sports fandom is really all about. Namely, the money only flows one way. We're wired for tribal allegiance. To believe in forces bigger than ourselves. To enjoy dramatic narratives. Pro sports provide all of the above - and the pro sports economy takes full advantage. A fan's relationship to a team is similar to the relationship of an oil well to a petroleum company: the former gives, the latter takes, and that's that. Someone like Washington Redskins owner Daniel Snyder isn't in the business of winning football games; he's in the business of cash extraction. From your wallet. And he's very, very good at. Which hardly makes him unique. Teams and leagues pump the well at the turnstile; by charging $8 for beer; by selling your eyeballs to advertisers; by extorting publicly-financed stadiums and sweetheart lease deals; by collecting subsidies and tax breaks and bulls__t antitrust exemptions; and in a hundred other ways. Don't get me wrong: sports provide entertainment in return for cash. But entertainment is an experience, a memory, and not a tangible good; it's not something you can turn around and hawk on the open market. I like Bailey a lot. I hope he works it out with the Clippers. But frankly, this is what happens when the casino suspects you're counting cards. You get the boot.